Abstract: The flow rate and inhalation performance of a patient using a dry powder inhaler (DPI) can be inferred by analyzing the sound that is naturally produced by the DPI during the process of inhalation. A novel method is described in Lee et. al . However, this method performs best in a clinical environment in which the background noise is low and well controlled, and does not overwhelm the inhaler’s acoustic signature. In order for acoustic analysis of an inhaler to work robustly in a typical use environment, such as homes, work places, or out in public, where it is subjected to surrounding noise interference, improvement to the extraction and characterization of the DPI acoustic signal is required. 1. Lee SM, Lim KM, Harris D, Seeney P: A novel method using a smartphone to capture and analyse patient inspiratory profiles. In Drug Delivery to the Lungs 2017. The Aerosol Society. Edinburgh, UK: 2017: Poster 35. 2. 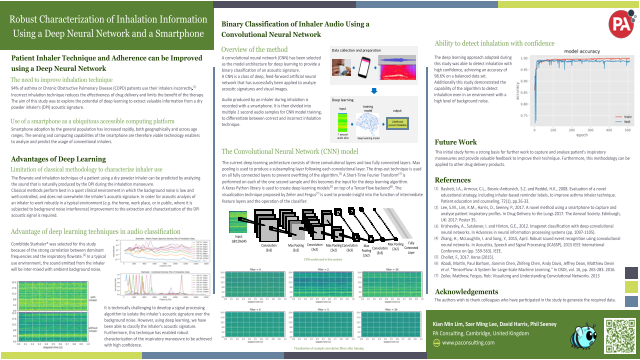 Zhang H, McLoughlin I, Song Y: Robust sound event recognition using convolutional neural networks. In 2015 IEEE International Conference on Acoustics, Speech and Signal Processing (ICASSP). South Brisbane, QLD: 2015: 559-63.